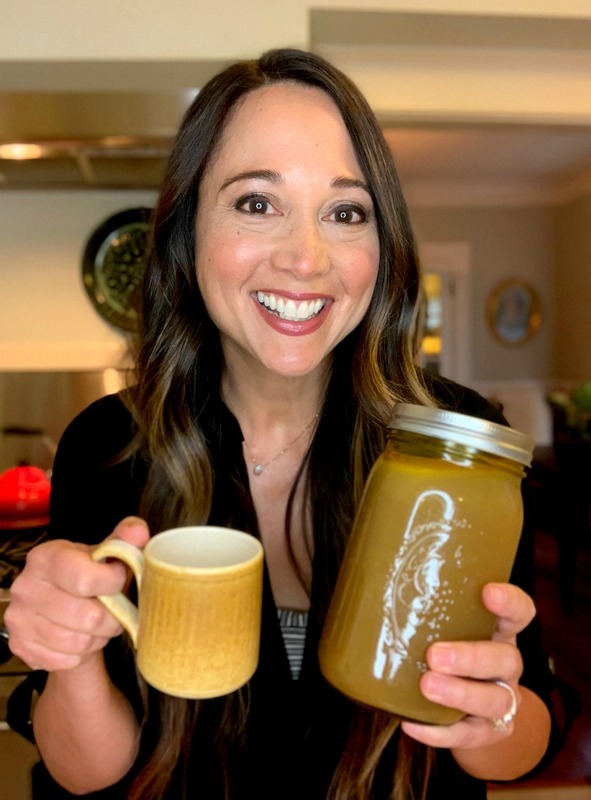 Bone broth seems to be all the rage these days. But what if you have high cholesterol, or are trying to follow a heart-healthy diet? Or what if you don’t eat animal products at all? Here’s the good news: you can still get your broth fix and enjoy all of the health benefits… without using bones! This Vegan Bone Broth is soothing, savory, and filled with nutrients from whole vegetables and dried mushrooms. In addition, this recipe calls for dried seaweed, which delivers important minerals and nutrients to support a healthy thyroid. Please don’t worry about putting seaweed in your broth. I know it might sound weird, but using seaweed in the kitchen can offer powerful healing. In addition, seaweed is a great flavor enhancer. Kombu is known for reducing cholesterol and high blood pressure. It is high in iodine, which is essential for healthy thyroid function. It also has iron, which helps carry oxygen to the cells; calcium, for healthy bones and teeth; as well as vitamins A and C, which support eyes and immunity, respectively (source: Washington Post). You can enjoy warmed broth on its own with a generous pinch of sea salt, or use it as a base for your own soups and stews. You can also have a cup of broth to avoid snacking on unhealthy options such as chips and crackers. This recipe in an adaptation of the recipe in CAP Beauty’s gorgeous book, High Vibrational Beauty. You can also find the CAP Beauty version here. NOTE: the kombu (seaweed) needs to be soaked in the refrigerator overnight before prepping the broth. Remember to keep the soaking liquid. 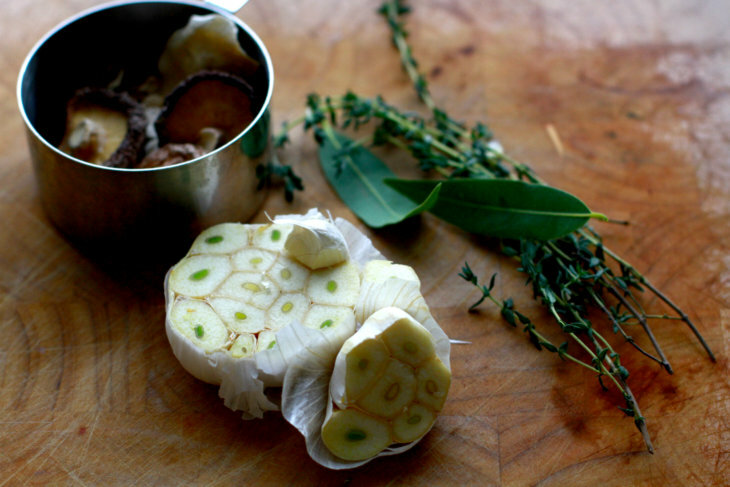 This mineral-rich water will be used for the broth. UPON SERVING: add salt to taste. Stir in a teaspoon of apple cider vinegar, lemon juice, or some pressed garlic if desired. Soak 4 cups of the water and kombu together overnight in the refrigerator. 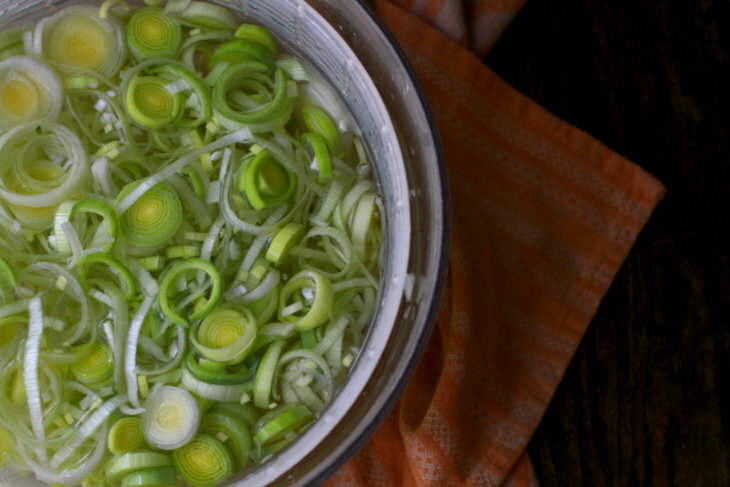 Remember to reserve the mineral-rich soaking liquid — you'll need it for the broth. To prepare the broth: warm the oil for a minute or so in a large stockpot over medium heat. Add the onions and sauté, stirring occasionally, until translucent. Add in the carrots and leeks. Continue cooking and stirring occasionally until the vegetables soften, between 5-10 minutes. Slowly add the reserved kombu and soak water to the pot. Pour in the remaining 4 cups of water and all remaining ingredients. Stir, and turn the heat to medium high. Right before the mixture reaches a boil, pull out the kombu and discard. Bring the remaining broth to a boil, then reduce to a simmer. Gently cook undisturbed for 2 hours. If the liquid starts cooking off too quickly, reduce heat and add some more filtered water. After a couple of hours, turn off heat and strain the broth using a fine mesh sieve and/or a cheesecloth. Discard or compost the leftover vegetables. Upon serving, add a pinch of sea salt, lemon juice, or apple cider vinegar to taste. I also like to add a bit of pressed garlic.